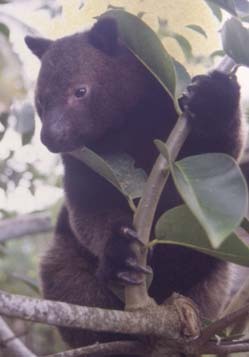 The tenkile is a marsupial that weighs about 10 kg (22 lb). It is found in mossy mountain forests from 900 - 1500 m (3000 - 5000'). The diet of the tenkile includes tree leaves, ferns, and soft vines. This tree kangaroo is diurnal and mainly terrestrial. It probably breeds throughout the year, with females giving birth at 12 month intervals. In the past, family groups of up to 4 individuals were seen. However, most recent sightings have been of solitary individuals or a female and young pair. The tenkile was apparently more common and widespread in the past. It is currently found in three locations in Sandaun Province in northwestern Papua New Guinea. Hunting is its main threat. *** The tenkile has a powerful odor which persists for up to a week on the hands of someone who has picked up one of the animals. Hunting is the main threat to the tenkile. The tenkile weighs about 10 kg (22 lb). It is found in mossy mountain forests from 900 - 1500 m (3000 - 5000'). The tenkile probably breeds throughout the year. The diet of the tenkile includes tree leaves, ferns, and soft vines. The tenkile is diurnal and mainly terrestrial, although it climbs trees to rest and escape predators. Flannery 1995, IUCN 1994, IUCN 1996, IUCN 2000, IUCN 2003a, IUCN 2004, Kennedy 1992, Tenkile Cons. All.